Gentec Electro-Optics is specialized in laser beam and terahertz source measurement and analysis. With an outstanding 45-year track record of innovation, developing and providing state-of the-art technologies to the laser market, Gentec-EO has become The Expert of the laser beam measurement field. For all sorts of laser applications from the factory to the hospital, laboratory and research center, Gentec-EO offers the broadest range of off-the-shelf and custom solutions, and stands ready to serve you now and in the future. Gentec-EO has a long history of achievements. Get the full story and discover who we are in our company profile. Also learn more about our fields of expertise and our products. The decision of adopting “Partners for Accuracy” as our branding slogan is the result of a long evolution that spanned over more that 45 years. It came to us naturally since it represents our very essence. We have always aspired to be more than a simple supplier of state-of-the-art laser measurement technologies. We truly believe that developing a very close partnership with our customers is essential and beneficial for every party. By definition, “partnership” means “aiming at the same goal” and “working together”. This is what is driving us. As for “Accuracy”, it does not solely refer to the precise measurements we are able to provide, but also to the complete understanding of our customers’ needs and expectations. Finally, the key to our success is to focus all our energy into “rigorousness”. No matter what the situation, Gentec-EO is always proud to offer its customers the most accurate laser measurements as well as the most personalized help for the development of custom products and solutions. The first laser energy meter in the world has been initially developed for internal use as Gentec Inc. were putting the first high repetition rate TEA CO2 lasers on the market in 1970. Gentec, Inc. introduced the first pyroelectric joulemeters shortly after that. They were also the first to manufacture both thermopile and pyroelectric laser power and energy meters. In the mid-1990s, the company introduced the WB series (today known as the W5 and W9 series) with an average power density damage threshold of over 100 kW/cm2 that is still unrivalled today. In 2000, Gentec Electro-Optics, Inc. was formed from Gentec, Inc. so that it could focus entirely on laser beam measurement. The acquisition, in 2010, of Spectrum Detector Inc. allowed to add measurement solutions for the new and rapidly expanding THz market, ultra-sensitive optical energy meters for applications down to femtojoules, instruments for pulse to pulse energy measurements up to 200 kHz and Optical TRAP detectors that act as primary calibration standards, to name a few. Gentec-EO has an evergrowing presence everywhere around the world. We currently have partners in over 40 countries, and each year, we keep adding new partners. We also have a strong presence in most of the European and Asian countries and we now have offices in USA and in Japan, in addition to our headquarters in Canada. When you send a unit back to us for repair or recalibration, you are entitled to expect your unit back in as short a time as possible. 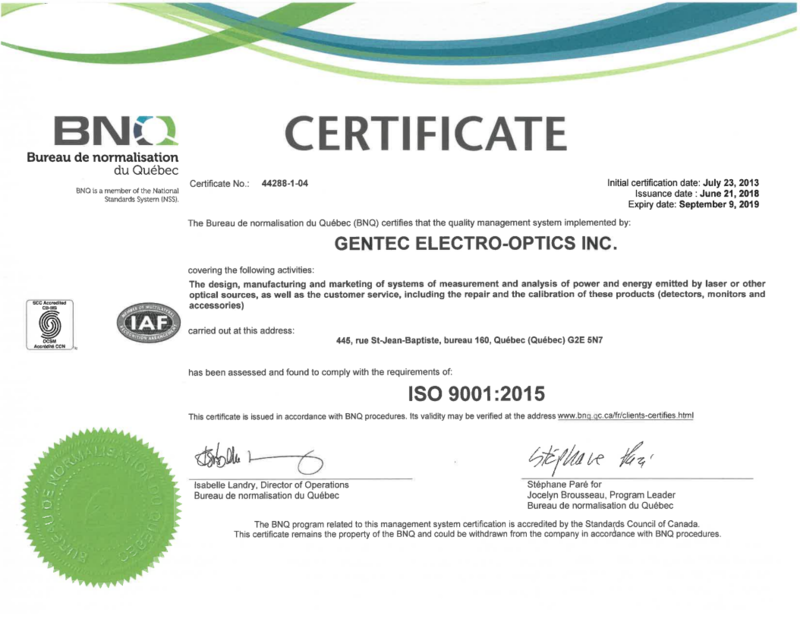 Gentec-EO is certified ISO 9001 since 2013. The certification covers the following activities: design, manufacturing and marketing of measurement systems and analysis of power and energy emitted by laser and other optical sources, as well as customer service, including repair and calibration of these products (meters, detectors and accessories). Gentec-EO has obtained ISO/IEC 17025:2017 accreditation on April 2nd, 2019. The accreditation covers electrical calibration of optical power meters and energy meters, as well as photometry and radiometry activities of these devices. ISO/IEC 17025:2017 is an internationally recognized standard that defines the requirements for competent testing and calibration in laboratories. It ensures that activities are conducted with impartiality and ensures consistent operation of laboratories. On behalf of my team, I would like to express our sincerest appreciation for your contribution, working diligently to supply material in a timely manner. As one of our strategic suppliers, you and your team helped ESI to meet customer deliveries and revenues for our FY18 Q1 & Q2. We look forward to your continuous support in helping us meet the challenges of the markets we serve and all the good work being done to bring both companies to the next, new height of success. We had the opportunity to use the FLASH laser power meter yesterday, and it performed admirably…merci beaucoup for all the help you gave me in choosing this meter… your entire staff was helpful and professional… I would not hesitate to recommend your company to anyone needing help with a laser beam… Again I thank you and wish you a record sales year!! !